This post was originally posted on March 19, 2009 at Hoyden About Town. New Scientist this week published an interview with infamous psychiatrist Simon Wessely. Wessely persists in believing, in the face of all the evidence, that Chronic Fatigue Syndrome/Myalgic Encephalitis (CFS/ME)* is a uniquely UK/American psychological condition caused by internet-triggered “faulty illness beliefs”. Here’s a bit. Read the rest at the link. Can people think themselves sick? This is what psychiatrist Simon Wessely explores. His research into the causes of conditions like chronic fatigue syndrome and Gulf war syndrome has led to hate mail, yet far from dismissing these illnesses as imaginary, Wessely has spent his career developing treatments for them. Clare Wilson asks what it’s like to be disliked by people you’re trying to help. How might most of us experience the effects of the mind on the body? In an average week you probably experience numerous examples of how what’s going on around you affects your subjective health. Most people instinctively know that when bad things happen, they affect your body. You can’t sleep, you feel anxious, you’ve got butterflies in your stomach… you feel awful. When does that turn into an illness? 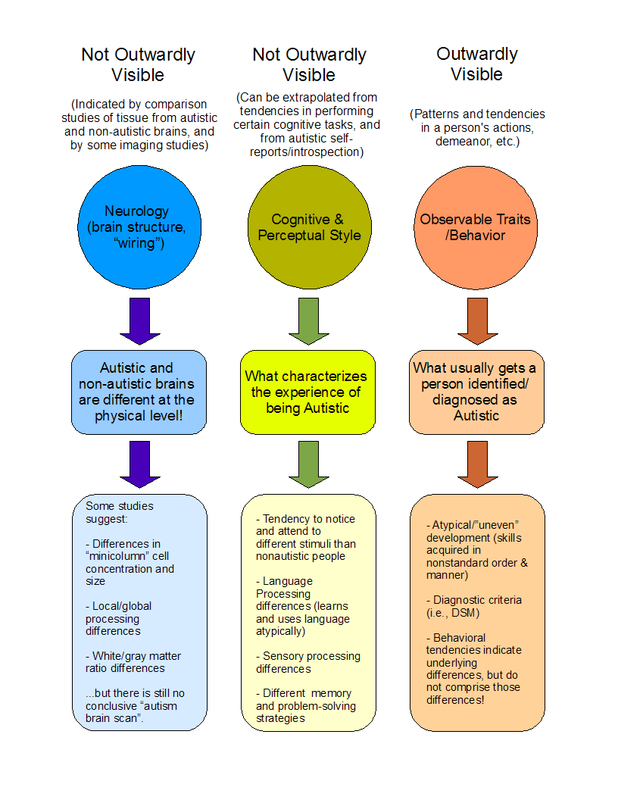 Amanda flags a great post by Anne C at Existence is Wonderful, which catalogues “three different ways of looking at autism — in terms of neurological structure, in terms of lived experience, and in terms of outward behavior.” And Anne does such wonderful things with this delineation. Click through to read the whole post, which addresses attitudes toward autism in particular, but I think Anne hit on something that can be safely generalized outward — her three approaches toward autism can also, in fact, be three approaches toward disability. * Neurology (Brain Structure/Wiring): Autistic and non-autistic brains are different at the physical level! * Atypical/”uneven” development (skills acquired in nonstandard order and manner); Diagnostic criteria (i.e. DSM); Behavioral tendencies indicate underlying differences, but do not comprise those differences! Some highlights, all emphasis mine. My guess is that there are probably multiple underlying structural variations that can produce “autistic phenotypes”, and it will be interesting to see how this pans out, but at any rate, one important aspect of how I presently conceptualize autism is the fact that some structural differences do seem to really exist. And if the difference does indeed go “all the way down” to the brain, as it appears to, then it makes very little sense to (as some seem to) view autism as some kind of disruptive “module” overlaid upon a typical brain. This is significant both in the cognitive science and the ethics realm, as it indicates (a) that experiments presuming autistic brains to be “broken versions of normal brains” are likely useless, and (b) that the best ways to help autistic people learn and develop functional skills are those which acknowledge an underlying and pervasive difference as opposed to those which presume that autism can be “removed” or “trained out” by simply eliminating surface behaviors. Yes! Autism, or any disability, is not a case of “a normal brain gone wrong.” It is not a defect or even a modification of a “normal” brain. It is, simply put, variation. We will never overcome society’s confusion and mistreatment toward pwd as long as we think there is any such thing as a “normal” brain (or body) at all. Is any one color or pattern of a cat’s coat a “normal” one? Or are there many varieties, none inherently better or more-important than the others? At heart of society’s approach toward disability is the assumption that there is a standard template for the human body, and if any one body turns out to be different, it is a deviation from that standard. As such, the solution to any problems resulting from said differences is to attempt to make up for that “deviation,” to attempt to make the “defective” body more like the standard template in whatever way possible. Put this way, it is obvious that this approach is misguided at best. The solution is not to change the individual body to fit the narrow, faulty expectations, but to adjust those expectations to include the range and diversity of the human experience. Mind you, none of this is meant to imply that I (or the researchers engaging in the experiments demonstrating visual-spatial trends in autistic persons) believe that autistic people cannot be disabled. Certainly, “uneven” development (which may include significant delays alongside “advanced” skill acquisition in some individuals), communication difficulties, and consequent social, educational, and occupational issues are very real. However, the existence of real disabilities and difficulties need not imply that the “whole person” is somehow diminished by the fact of being autistic, or that one cannot have attributes which exist as both strength and weakness depending upon the context. The orange column on the right of the diagram summarizes what most people probably think of as “autism” — that is, the externally-visible things that generally get people suspected of being, or identified as being, autistic in the first place. This is where we see such things as diagnostic checklists, observations about a person’s developmental milestones (and when/if they meet certain expected ones), outward actions, language use, body language, tone of voice, social/educational/occupational success (or lack thereof) in the absence of modifying factors, etc. What is interesting, and perhaps a bit unnerving, is that this category is at once the one people tend to put the most stock in (in terms of identifying autistics, in terms of determining what educational supports we might need, etc.) and the one most subject to cultural biases, personal biases, misinformation, and the ever-changing social lens through which different kinds of people are generally viewed. …which, honestly, is a bit scary and unsettling for those of us who are going to be the ones to bear the consequences of any such things.